Belfast or Glasgow - Which city is better to live and work in? Belfast or Glasgow? Which is better to live and work in? Price of living costs: To rent a single bedroom in Glasgow city centre, you will only have to spend an extra 13% on what you would pay for a bedroom in the centre of Belfast. If you want to rent a 3-bedroom apartment outside of the city centre, it will cost you 30% more. Despite this, purchasing clothes in Glasgow is cheaper than Belfast. A single pair of jeans will cost you 3% more in Belfast than Glasgow. How about the basics after you pay your rent? Well, electricity and heating will cost 49% more in Glasgow than Belfast..
Higher Salary: Are you wondering how far your wage will stretch? Well the average monthly salary in Glasgow is 32% more than Belfast.. The higher salaries being offered in Glasgow don’t necessarily cover living costs, particularly as basics such as heating, electricity and water will cost a staggering nearly 50% more. Dynamic City? Belfast in the past twenty years and beyond has really turned a corner, with a dynamic city centre, evolving tourist industry and growing technology industry. The city centre itself has gone from strength to strength since Victoria Square was established 10 years ago. The technology scene in Belfast is booming. The recent event, Digital DNA hosted speakers from around the globe. There is the ‘Smart City’ Belfast Agenda, increased inward investment from FDIs, hubs for tech start-ups, a hive of meetups and a tech culture of sharing and learning. Belfast has really put itself on the map. Glasgow possesses a 21% higher local purchasing power rate than Belfast. Belfast has the perfect balance of growth and opportunity to build connections and has a warm undertone that is embedded into it. 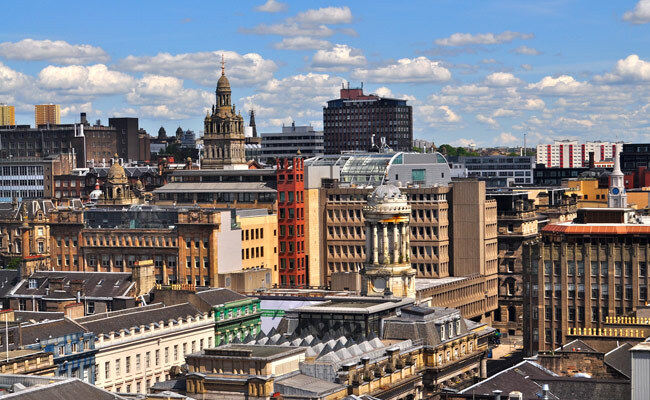 Glasgow also has large technology firms within it, despite not being on the scale of London or Dublin, the opportunities in Glasgow are there. The price of living in Glasgow could still be a deterrent from establishing roots there. Belfast offers more affordable accommodation, however, the price per square meter to purchase an apartment outside of the city centre is 0.75% more expensive in Belfast than Glasgow. Transport expenses: Transport prices in both cities varies significantly and marginally depending on what mode you are wishing to take. If you are wishing to blow off some steam after a hard day’s work at the office, a normal taxi tariff in Glasgow will cost 130% more than Belfast. If you wish to purchase a car a Volkswagen Golf will cost 15% more than purchasing in Belfast. Getting the bus might be a cheaper bet! Entertainment: In terms of lifestyle, Belfast is described as having quaint bars and plenty of up market bars and restaurants. A meal in a mid-range restaurant would set you back 11% more in Belfast than Glasgow. If you decide you want a drink? A drink in The Duke of York on Cathedral Quarter would be a top-notch experience. A beer will cost you 10% more in Belfast than Glasgow. Do you want to rent a tennis court for an hour on a Saturday? Well, that would set you back 15% more in Glasgow than Belfast! Dublin vs Belfast – Which city is the best to live and work in? What LIE do we tell ourselves about leadership?